Listening to one of my favorite podcasts, Inside Quest, Tom Bilyeu had a dynamic guest, Lisa Nichols, on the show. Every episode I watch or listen to builds a fire for my work in education. “Hurt people hurt. Sad people make others sad.” was just one of her quotes, but her inspiring message brought an image of where I want education to go. She challenged listeners to ‘Fly’ in this must-see this episode. Picture a person walking down a street. The person has a vision for the future. In my case it is a vision for a better educational environment for our students that promotes learning in this day and age. As I allowed this image to be real in my mind, it hit me…Don’t Look Ahead! Something screamed at me not to keep looking ahead. Then, the crystal-clear moment arrived. It made sense. If I continue to seek my vision straight ahead/to project it in a direction from where I came, I am not changing anything. I must walk and gain a vision and path I cannot see. Where is it? Around the corner of an intersection. 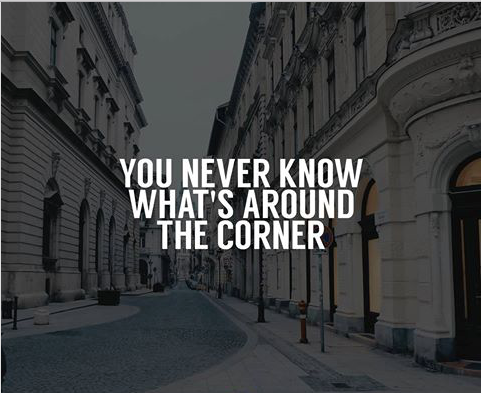 So you say, “But you can’t see around the corner?” Exactly. Those that dream big dreams cannot see every piece of woven fabric that embodies the vision. We continue with the process because we believe the unknown can be better than the present. It forces you and I to wrestle with the question, ‘What do we do with an obsolete educational model?’ There is a strand of leaders in education working to make this turn, but more educators need to test the establishment for the sake our learners today. My moonshot for education will be a series of reflections from this blog. This entry was posted in Uncategorized and tagged Inside Quest, Lisa Nichols, moonshot, Tom Bilyeu on August 31, 2016 by darrenellwein. What do we do with an obsolete school model? Keep tweaking it, one teacher at a time. Dream big, Darren! I think first more educators have to be convinced that it is obsolete. We need more people like you leading the way.